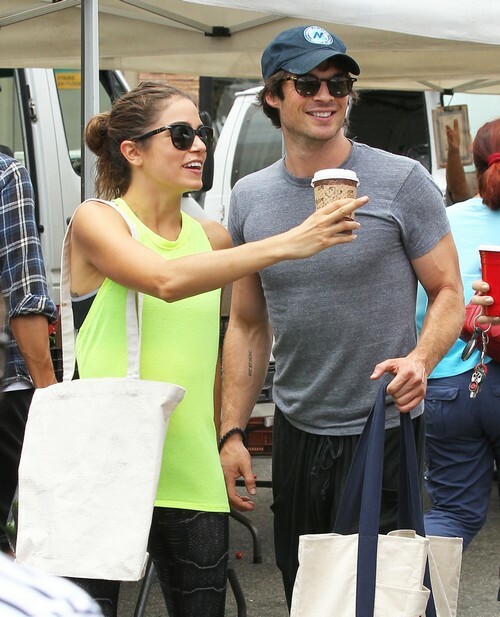 Is he confirming his impending nuptials with Nikki Reed? It’s telling that he never said the ‘m’ word during all of his years of dating Nina Dobrev, but a few months of dating Nikki Reed, and he’s already talking marriage? Poor Nina. Ian is doing everything in his power to make his relationship with Nikki seem more important than his relationship with Nina, starting with his full-fledged support of Nikki on Twitter and his constant PDA-ing with her. But did he ever do that with Nina? That would be a big, fat no. I don’t blame Nina for going and hooking up with every other single guy at Comic-Con. She was with Ian for a few years, and this is what she gets? Marriage talk the minute he gets together with someone more age-appropriate? I think we’re also starting to see why Nina and Ian broke up, actually. Ian clearly wants to get married, and we already know that Nikki is on board for that, since she just divorced from her first husband. And Nina wasn’t into the idea of settling down and having babies at such a young age, so Ian went and found someone who was. This sort of thing happens all the time in the dating world, but it’s certainly going to make things awkward when Ian bring Nikki around for filming.